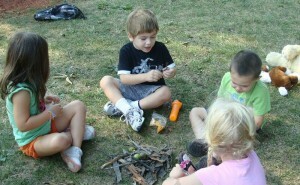 PHOENIX, NY – The preschoolers at Discovery Day Care enjoyed “Camping” Day with their friends. Sitting by their pretend fire is left: Addison McCoy, Chase Turner, Ethan Snyder and Caila Einbinder. The children had a nice picnic lunch outside, brought their sleeping bags for nap time and they also made binoculars to see if they could find any animals out on their adventure during outside time. A member agency of the United Way of Greater Oswego County, OCO provides more that 50 vital services throughout 80 separate locations.